Global wearables brand, Fitbit, recently got with the smartwatch craze and launched a very Starwars-esque inspired timepiece – the Fitbit Ionic. The Fitbit Ionic hit a few selected stores in South African in October 2017 and will carry a price tag of around R5,499. According to Fitbit, this health and fitness first platform, the Ionic, offers a highly personalised experience not previously seen in other smartwatches. It builds on Fitbit’s health and fitness expertise with a new relative SpO2 sensor (SpO2 stands for peripheral capillary oxygen saturation. It’s is an estimate of arterial oxygen saturation, owhich refers to the amount of oxygenated haemoglobin in the blood). This however makes it possible to track deeper health insights like sleep apnea in the future. The smartwatch also boasts industry-leading GPS tracking, on-device dynamic workouts, improved heart rate tracking, and water resistance up to 50 meters. But wait… there’s more… smart features like contactless payments, on-board music, smart notifications, and a variety of popular apps and clock faces are also now available in the Fitbit App Gallery. Ionic has all the core features users love from Fitbit like 4+ day battery life, automatic activity and sleep tracking, and cross-platform compatibility. 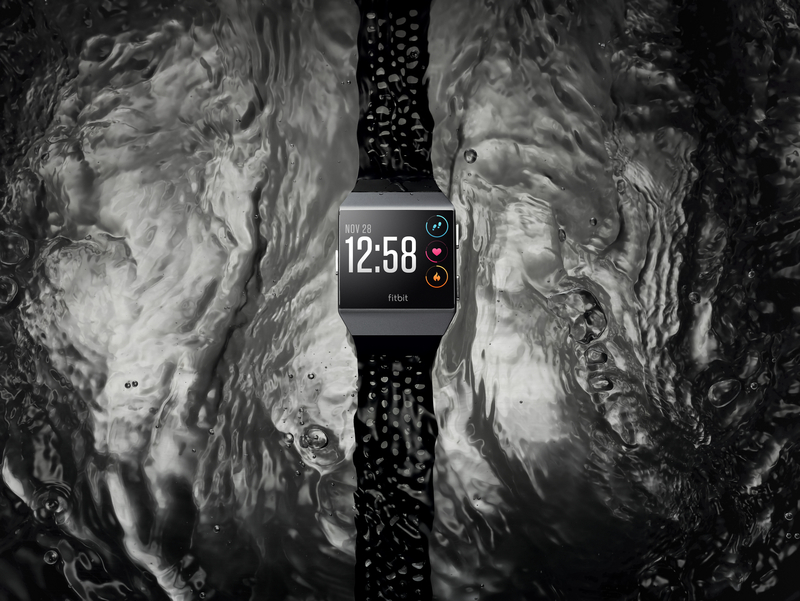 Ionic will be available at select local retailers from mid October 2017, with a new Fitbit Ionic adidas special edition device coming in 2018. The Fitbit app software development kit (SDK) will be open to developers in September 2017. Fitbit Ionic in core colors: burnt orange case with slate blue, smoke gray case with charcoal band, and silver case with blue gray band. As Fitbit’s first device designed fully in-house, Ionic features new processes and materials that improve weight, fit, durability, breathability and daily wear – resulting in an extremely lightweight, ergonomic design comfortable enough to wear all day and night. Utilising nano-molding technology, the unibody watchcase allows it to double as the Bluetooth and GPS antenna. This construction creates a stronger GPS signal that works in busy cities or on remote trails. Ionic is built to be more durable with new materials, new bands and more extensive testing than ever before. Easy to read display: A color, spherical glass touchscreen with crisp graphics and amplified brightness of up to 1,000 nits lets you read your stats wherever you are – in bright sunlight or a low-lit room. burnt orange tracker and clasp with slate blue band. In addition, accessories will be available in a black and charcoal or cobalt and lime two-toned breathable sport band, as well as a hand-crafted and perforated Horween leather strap in cognac or midnight blue. From beginners to experienced athletes, Fitbit’s most advanced device to date offers personal, actionable guidance to motivate you to reach your goals – all while keeping you connected with apps and notifications.